Who wouldn’t agree that breakfast is the greatest meal? I mean, come on. You can eat it for breakfast (duh), lunch, or even dinner. I know some of you make eggs on a skillet for dinner! 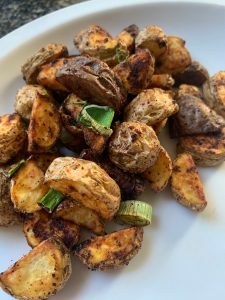 Although breakfast has a ton of possibilities, I would have to say breakfast potatoes are a pretty big staple in the brunch industry. The smokiness of the paprika with the earthiness of the parsley just pops flavor all over the taste buds. I love a little green in my food so the scallions were the perfect touch. Plus, they add another flavor component all on their own. Dice the potatoes into roughly 1 inch chunks. You want them to cook evenly so keep them around the same size. Toss the potatoes in a large mixing bowl with the oil, salt, pepper, garlic powder, paprika, and onion powder. Place the potatoes in a single layer on a baking sheet and bake at 425 degrees for 30-40 minutes. Flip at 15-20 minutes. Add the scallions for the last 15 minutes. The potatoes should be crispy on the outside and soft on the inside.